As part of an ongoing article I am just about to finish, I needed a thread safe ObservableCollection<T>. Now the native .NET framework doesn’t have one of those, but luckily it supplies you with the right job to create one using some of the Threading APIs. Today I was asked something about a DateTime manipulation in SQL server, and one of my learned collegues piped up about a DateTimeOffset Type. Now I have never used or even heard of this, so looked it up and low and behold there is now a new DateTimeOffSet type in .NET 3.5, that is supposedly better for globalization issues. There is a nice post about this over on the BCL team blog. I have just written a new article over at www.codeproject.com which talks about how to perform cross business object validation using a new idea that I had the other day. This technique is quite different from the standard IDataErrorInfo approach. The idea is that Each View is bound to a ViewModel, where the ViewModel may hold many business objects which may need some sort of cross validation. Today at work, my colleague and I decided we needed a graph control. 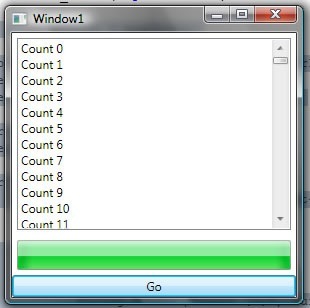 And after about a day we came up with the following WPF control. I think its pretty cool. 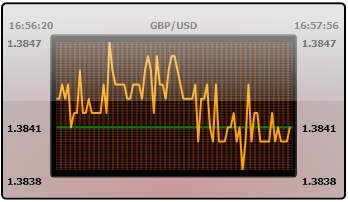 The low and high X-Axis points scale to suit the values Min/Max and the background changes shades according to the Mean of the values. Now I should point out that we already had a free graph that this control has more than a passing resemblance to. The original graph was done by Andre de Cavaignac when he was at Lab49. That said, we ended up using virtually none of the original code, apart from an attached property that changes the opacity based on the Mean of the values. The reason we decided to create our own is that the original graph was quite tied into Lab49 business, which did not suit our particular requirements. So bada bing, we knocked up this graph. I was very pleased with the results and it is done in only 2 classes. One is the graph and one contains the graph, and I think it is very easy to use. I will hopefully be posting the code up soon over at www.codeproject.com, so if this floats your WPF boat, watch our for it over there soon. 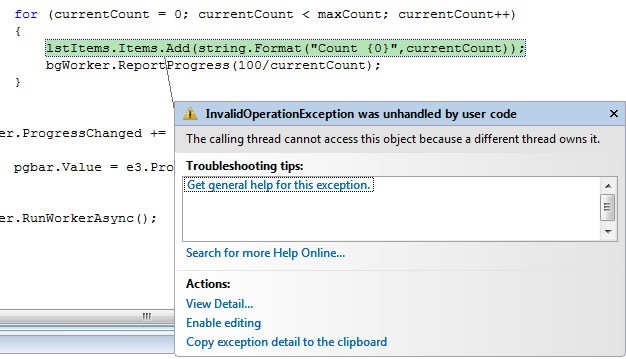 If you are working with WinForms or WPF you will more than likely run into some long running operation that you would like to run in a new thread. A novice may actually try and create a new Thread, which is ok, but that means you are responsible for the entire lifecycle of your new thread. Which gets tricky. A better approach would be to use the ThreadPool or use a BackgroundWorker component which uses the ThreadPool beneath the surface. However, even using these approaches the cardinal rule is that the control is owned by 1 thread, the thread that created the controls. That is typically the UI thread. So when you try and update the controls from a background thread you will run into problems. So how can we fix this, well we could use the Dispatcher.Invoke around the offending items, but perhaps a more elegant solution may be to use a extension method. Which when run allows cross threaded calls to be marshaled to the correct Dispatcher object. I am in the middle of so many article ideas right now that I am finding it hard to find enough time to look at them all, and some of them are pretty big articles. So what I have to do when this happens, is break them down into smaller areas, and look and see if any of the bigger articles would become clearer if I wrote it in smaller parts. I am currently working on one that has to do with extending LINQ and the whole System.Linq.Expressions namespace idea in general. Now I don’t want to give too much away about what I will be doing, but one of the fundamental parts of how the whole System.Linq.Expressions namespace works, is by the use of the "Visitor Pattern". If you have not used this pattern before, it is a structural pattern that can be used keep the algorithm separate from the object structure. I have used this pattern on a few different occasions and I for one really like it, though I do feel the standard visitor pattern could be improved a little. I have written a small article talking about the standard a possibly improved visitor pattern over at www.codeproject.com, you can use the following link to read more.